One of the biggest causes of the high cost of healthcare in the U.S. has been an utter lack of transparency in pricing, even for the most routine procedures. A recent study at UC San Francisco revealed the enormous price discrepancy, and in turn, a broken system: In California, the cost of a routine appendectomy ranged from $1,529 to a high of nearly $183,000. Patients are often referred to specialists by their physicians, end up paying exorbitant sums out of pocket, and are rarely told up front how much these procedures will cost — nor are they given comparisons. Generally speaking, it’s not the interest of healthcare providers to do so. Founded in 2008, San Francisco-based Castlight has been at the forefront of the movement to bring price transparency and comparison tools to healthcare, offering a B2B service that enables self-insured businesses to provide their employees with the tools to compare costs and quality of a wide range of tests and procedures. While there was plenty of resistance from providers off the bat, the value of this price transparency has been more than apparent in the amount of funding Castlight has raised to date — $81 million. Today, the startup is more than doubling its coffers, as it has announced the closing of a $100 million Series D financing. The round was led by two “major” (but unnamed) mutual funds, with contributions from T. Rowe Price, and Redmile Group. Castlight’s previous investors include names like Morgan Stanley, Wellcome Trust, U.S. Venture Partners, Maverick Capital, Oak Investment Partners, Venrock, and more. And based on the size of the round, that’s not at all surprising. From what we’re able to gather, based on Castlight’s own research as well as ours, the $100 million raise is one of the largest venture rounds for a healthcare IT company on record. The D round brings Castlight’s overall investment to $181 million, and with that amount of capital, and this huge new influx, one might be led to believe that Castlight is burning through cash. But, in fact, Isaacson tells us that the company still had the majority of that $81 million in the bank. Raising that kind of capital can become a distraction, but now that it’s more than flush, the CMO says that Castlight is going to get back to focusing on its product. To this point, the startup has more or less remained off the radar, and has remained focused on its 40-odd customers, which include Honeywell, Life Technologies, and insurance broker Willis North America. Considering that 70 percent of its customers’ employees use Castlight’s price comparison tool (with 61 percent saying they’ve changed their spending habits after using its service), the company is looking to expand. Already at 100 employees (and growing) itself, Castlight will be using some of its new dollars to expand its marketing footprint and ramp up its sales staff. The market opportunity is certainly there. U.S. health insurance premiums increased by an average of 8 percent between 2008 and 2009, and, as a result, employers have begun asking their employees to cover the difference. The lion’s share of those with health insurance in the U.S. are covered by their employers, and those numbers continue to grow. As more employers begin offering high-deductible plans, those on tight budgets tend to avoid going to the doctor unless it’s absolutely necessary. Thus, it’s become increasingly clear that the system itself is broken — there aren’t any good ways to regulate costs. What’s more, it’s been nearly impossible for people to accurately predict what the costs of surgeries, procedures or hospital bills will be, and though we are increasingly talking about “consumer-driven healthcare,” the system prevents people from acting like consumers. 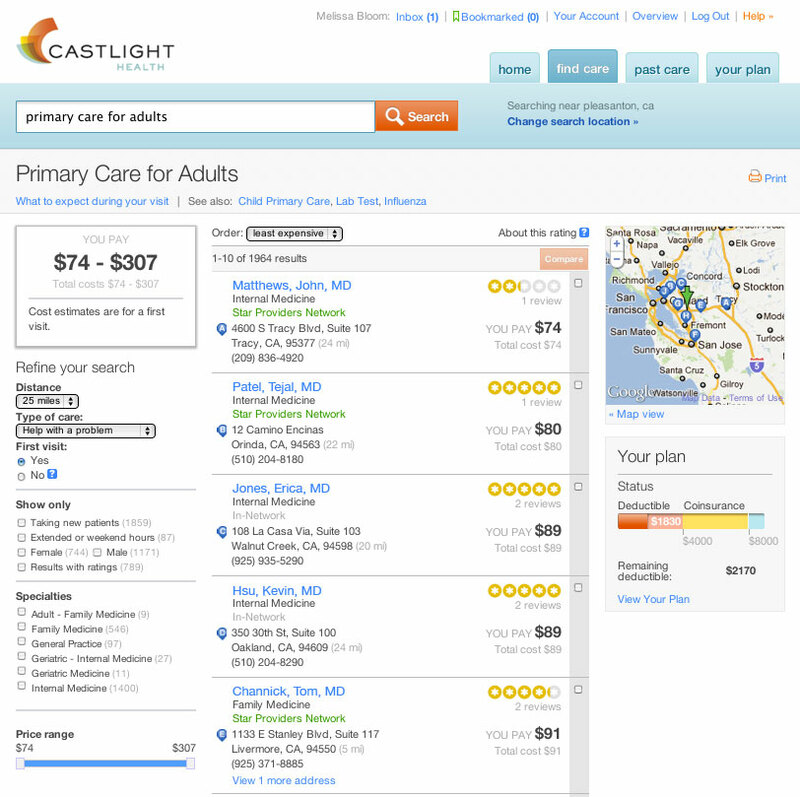 Castlight developed a healthcare management suite to enable employers to provide their workers with more reliable cost and quality information, which is essential given the tendency for tests and procedures to fluctuate wildly on these terms — even among practices that are geographically proximate to each other. The demand is certainly there, and Americans are yearning for solutions that bring more transparency to a bloated system. Of course, the demand has not gone unnoticed among insurance providers, many of whom are developing their own price comparison software. While this could potentially present Castlight with some competition down the road, being a third-party means being able to maintain relative attractive in comparison with the incumbents — and, Castlight hopes, objectivity. Furthermore, insurance companies haven’t had the best reputation over the years, and, due to contracts with hospitals and the like, some are restrained in what prices they can actually disclose. Given the choice between a third party and an insurance company, my guess is that many consumers would opt for the former. Another upside to Castlight’s model is that its customers have begun to get more sophisticated in the type of coverage they’re offering, as transparency is not only a benefit to employees, in the end, it has the potential to result in more workers opting into coverage, which boosts companies’ bottom lines. So companies have begun to offer reference-based pricing, which means that, if, say, an employee wants to get an MRI, Castlight’s data will show them that the price ranges between $800 and $1,800, with the median being $1,400. Companies can see that the employee can get a quality MRI for $1,400 in their area, so they’ll cover the cost of the procedure up to $1,400, and if the employee wants to opt for something more expensive, then they cover the rest out of pocket. This allows companies to maintain quality and extend of coverage, while giving their employees options that allow them to get the highest quality care without severe pain to their wallets. Up next, Castlight wants to expand its data offering and price comparison capabilities around pharmaceuticals, another area which is sorely in need of transparency and more sophisticated search mechanisms. Back in February, GoodRx raised $1 million from Founders Fund, GRP Partners, Highland Capital, SV Angel, and Lerer Ventures to do just that. Right now, Castlight is focused on honing its B2B/B2B2C products, making them more useful for a wider range of tests, procedures, and treatments. A consumer-only play would be an obvious extension of their current product set, but it looks like the company’s priorities remain squarely on B2B for the time being. For more on Castlight, check them out at home here.